Acrobat to Rich Text Converter software converts your PDFs to Word docs with complete adherence to layout, retaining images and all formatting. 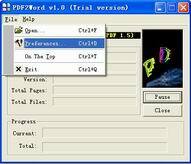 The application retains 100% original formatting and makes editing of PDF files easy. Buy VeryPDF PDF to Word for excellent PDF conversions without hassles! It’s fast. It’s consistent. It’s affordable. Acrobat to Rich Text Converter instantly converts PDF files into Microsoft Word documents that look just like the original - complete with all formatting and images! Information is set free - free to be edited and free to be integrated into your documents. Acrobat to Rich Text Converter is NOT dependency on MS WORD application, Acrobat to Rich Text software is a standalone program i.e. it does not require Microsoft Word, Adobe Acrobat, or Acrobat Reader for installation. Acrobat to Rich Text is a batch PDF Converter that you can convert a lot of PDF files to word documents once time! saving your time! Acrobat to Rich Text is a standalone software, MS Word, Adobe Acrobat and Reader NOT required! As customers evaluate VeryPDF solutions they often start looking under the hood to find different benefits from the underlying technology. One item that is commonly looked at is how we leverage the RTF format used by Microsoft Office. What is the RTF Format? The RTF format is at the core of the Microsoft Office system and is one of three core file formats which Microsoft supports natively along with DOC and DOCX. RTF is used throughout the Microsoft Office System to perform functions such as opening documents into Word and Cutting and Pasting content. Microsoft Word maintains multiple document types (.doc, .docx, .rtf) so moving around document types is a built in and common function. If you are a fan of reading technical specifications you can find the Microsoft RTF specification that is updated with each version of Office, including Office 2007. Since VeryPDF’s comparison technology leverages the benefits of converting to the RTF format we often hear questions about the effect this may have on the integrity of a document. Some people try and associate the RTF format with document corruption even though document corruption is not specific to format types like RTF. Corruption can occur in documents in the DOC and DOCX formats just as easily as RTF. Typically the problem is not in the document type itself, but in the underlining comparison technology, which is much more likely to compromise formatting than RTF, DOC or DOCX file types. This is one more example of why not all document comparison technology is the same. Round-tripping, the act of repeatedly sharing a document with other users, is also blamed for document corruption. But it’s not actually the conversion that causes the corruption issues. When documents are exchanged bad formatting, new styles and other word processing formats are often introduced into the master document when it is shared with other users. This is one reason VeryPDF solutions prevent new formatting styles from being incorporated into your document during any document exchanges. VeryPDF’s products ensure you maintain the integrity of the master version and avoid corruption issues. When document issues arise customers are right to be concerned about the underlying cause. Corrupt documents are the fear of many organizations, particularly at the 11th hour when you do not have the luxury of time. With technology solutions that have not been tested in thousands of different desktop environments you may well experience more than your fair share of corruption issues. Because of its ubiquity, RTF allows VeryPDF tremendous flexibility in successfully translating between any number of document types. VeryPDF products can not only maintain document fidelity, but provide portability advantages when moving around different Microsoft Word systems, or translating to other document types. It’s important to ask detailed and probing questions about underlying technologies like RTF file formats. The more you understand why and how technologies are used the more you ensure that the solution your organization leverages is the best fit for your needs.